What is an Altered Frenum? A tight or poorly positioned band of tissue connected to the lip, cheeks, or the floor of the mouth/tongue, also known as tongue-tie or ankyloglossia. The success of a frenectomy is based on the ability to provide a complete and effective release of the tethered oral tissues. The technique for the lingual frenectomy is based on precision: releasing the appropriate amount of tissue for maximal benefit. To achieve this, we individualize treatment and use a technique which is appropriate for each individual case. The frenectomies for lip and cheek are done by laser. The tissues of the lip and cheeks do not require sutures to heal by primary intention as scarring is a far less risk in these areas. 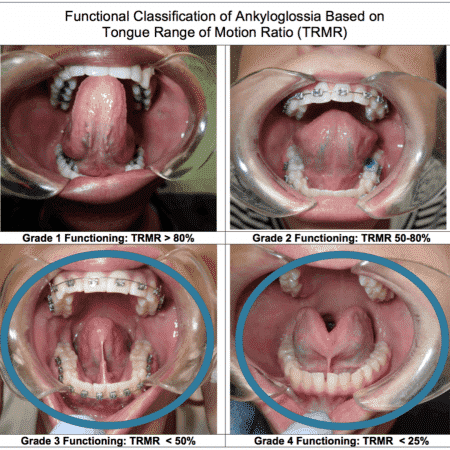 We work closely with the Myofunctional Therapist to treat your Orofacial Myofunctional Disorders (OMDs), which are disorders of the muscles and functions of the face and mouth. If there are altered frenums present there are almost always OMDs present whether we are aware of them or not. They may affect or have affected: breastfeeding, facial skeletal growth and airway development, chewing, swallowing, speech, occlusion, temporomandibular joint movement, oral hygiene, stability of orthodontic treatment, facial esthetics, and more. In order to ensure success, Myofunctional Therapy is required for pre and post surgery for optimal function and healing.